There is evidence that the atmosphere enveloping the early earth was very different than it is today. At one time the entire earth enjoyed a warm tropical environment and there was enhanced oxygen in the atmosphere. Organisms grew larger and lived longer as a result. 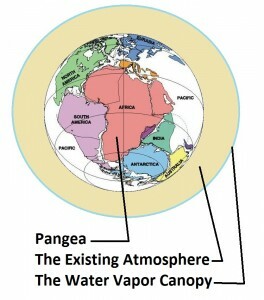 Many creationists have attributed this to a water vapor canopy that was created by God on the second day, the “waters above the firmament” (Genesis 1:7). 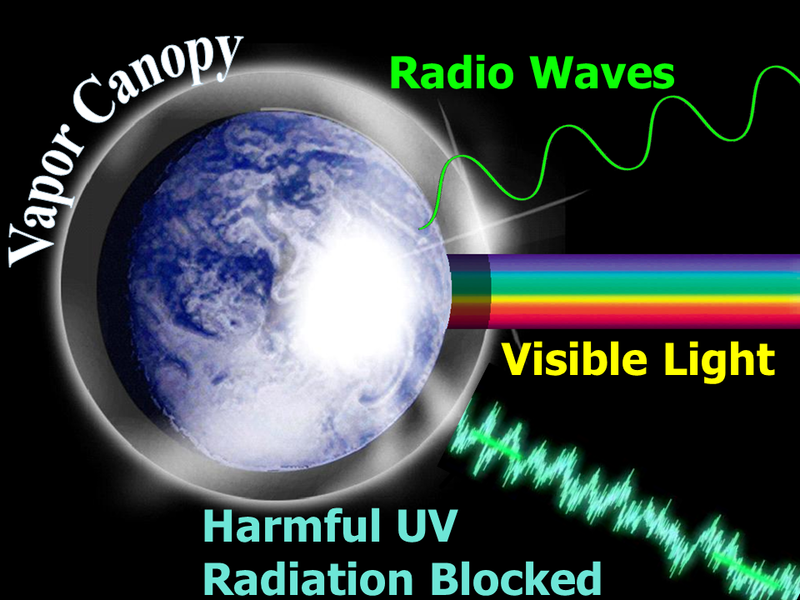 This theory holds that a “vast blanket of invisible water vapor, translucent to the light of the stars but productive of a marvelous greenhouse effect which maintained mild temperatures from pole to pole, thus preventing air-mass circulation and the resultant rainfall (Genesis 2:5). It would certainly have had the further effect of efficiently filtering harmful radiation from space, markedly reducing the rate of somatic mutations in living cells, and, as a consequence, drastically decreasing the rate of aging and death.”(Morris, Henry, Scientific Creationism, 1984, p. 211.) Citing evidence of denser atmosphere in the past, Morris postulated that this vapor layer could have dramatically increased the atmospheric pressure on the surface of the early earth, again contributing to a healthier environment (like a natural hyperbaric chamber). Later the canopy would have collapsed in the form of rain (the “windows of heaven” in Genesis 7:11), contributing to the Flood water, and resulting in the dramatic drop-off in longevity after the deluge. Genesis 9 tells how Noah planted a vineyard after the flood and became drunk from the fruit of it. This is an aberration in the life of this godly man. Some have suggested that Noah did not know his grape juice would ferment so quickly or so extensively in the post-flood atmosphere. Or perhaps the reduced atmospheric pressure made it harder for him to “hold his drink.” While this is only speculation, the removal of the vapor canopy could help explain this curious situation. Some creationists emphasize other factors that may have caused the worldwide temperate conditions that existed before the Flood. They stress the evidence of far greater concentrations of carbon dioxide levels in the past and point out that the earth’s magnetic field was far stronger than today. This could have acted as the shield for cosmic radiation and produced the healthier environment. (Humphreys, Russel D., Starlight and Time, 1995, p. 63.) John Baumgardner of Los Alamos has suggested that the atmosphere surrounding the original earth was far thicker than it is today and that the exploding of the fountains of the great deep during the initial stages of the Genesis Flood stripped some of this atmosphere away. Certain Bible scholars cite the language of the Psalm 148:4 as evidence against a vapor canopy. If the canopy had collapsed during the flood, they reason, why does the Psalmist still reference the waters above the firmament? 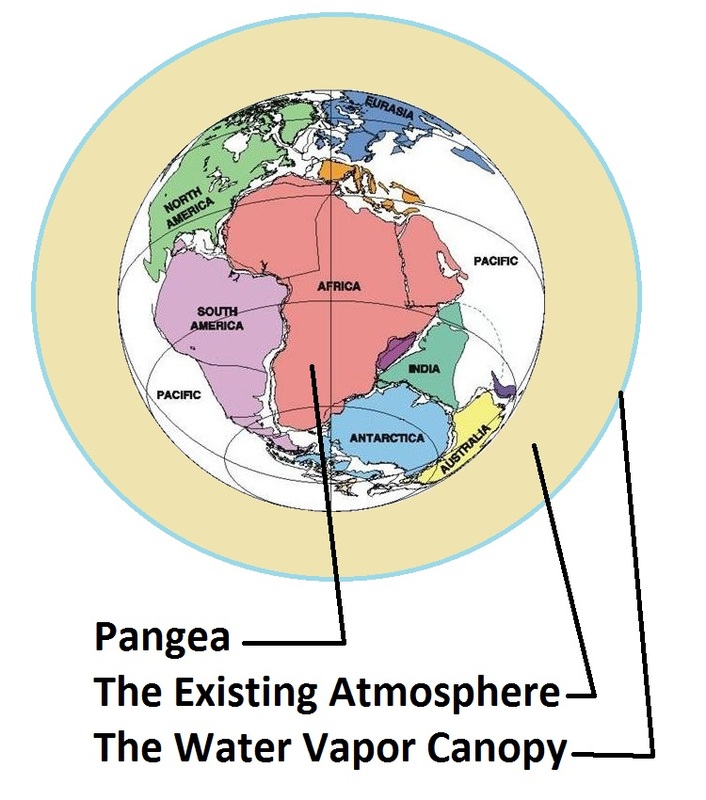 But this poetic allusion could hark back to the original creation, or it could make reference to waters God expanded out into deep space as part of creation, or it could refer to some of the original water vapor (left over from the canopy) still in the outer reaches of our atmosphere. 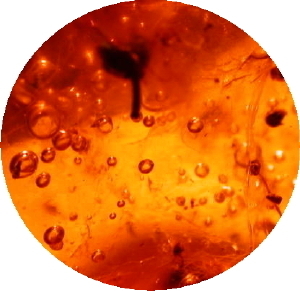 Other studies of air bubbles in amber have found increased pressure as well as greater oxygen levels. “One implication is that the atmospheric pressure of the Earth would have been much greater during the Cretaceous era, when the bubbles formed in the resin. A dense atmosphere could also explain how the ungainly pterosaur, with its stubby body and wing span of up to 11 meters, could have stayed airborne, he said. The spread of angiosperms, flowering plants, during the Cretaceous era could have caused the high oxygen levels reported by Berner and Landis, scientists said last week.” (Anderson, Ian, “Dinosaurs Breathed Air Rich in Oxygen,” New Scientist, vol. 116, 1987, p. 25.) A Yale study published in the March 3, 2000 issue of Science independently confirmed the high levels of oxygen present in the earth’s distant past. Some have even suggested that without such an atmosphere the relatively small lung capacity in certain dinosaurs could not have supplied their massive tissue with the needed oxygen. In October 2006 Science Daily publicized a study led by Arizona State University staff entitled “Giant Insects Might Reign If Only There Was More Oxygen In The Air.” The article claims, “The delicate lady bug in your garden could be frighteningly large if only there was a greater concentration of oxygen in the air, a new study concludes. 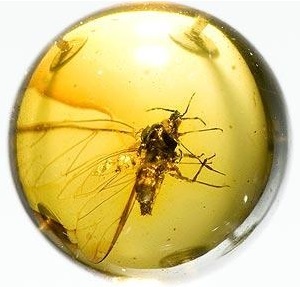 The study adds support to the theory that some insects were much larger during the late Paleozoic period because they had a much richer oxygen supply, said the study’s lead author Alexander Kaiser. The Paleozoic period…was a time of huge and abundant plant life and rather large insects — dragonflies had two-and-a-half-foot wing spans, for example. The air’s oxygen content was 35% during this period, compared to the 21% we breathe now, Kaiser said.” This research concurs with the biblical model of the early earth. In 2010 researchers at Arizona State University presented the results of experiments raising insects in various levels of atmospheric oxygen. Ten out of twelve varieties of insects studied decreased in size with lower oxygen. Some, like dragonflies, grew faster and became bigger in an enriched oxygen atmosphere (Science Daily, October 30, 2010.). Some object strongly to using the scriptures to gain scientific insight into the natural world. While the Bible is not a science text, there are several clear lines of evidence that the Bible is God’s Word. If God’s word is truly inspired, it speaks accurately to all areas of knowledge: historical, political/economic, sociological, and scientific.